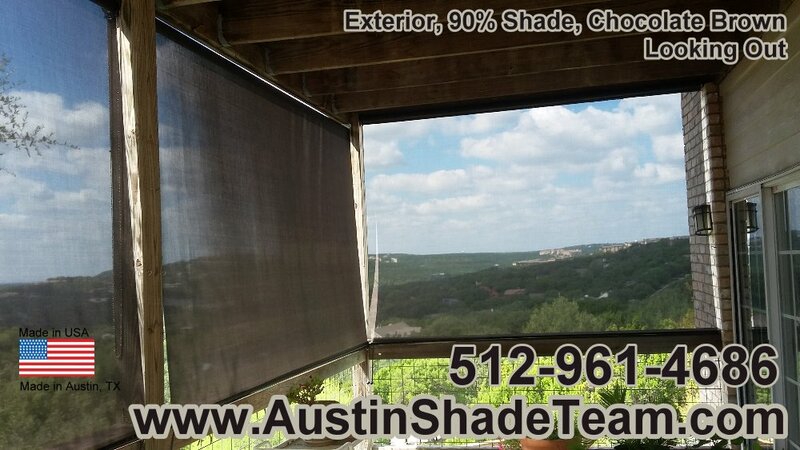 Our Austin Patio Sun Shades are priced right and will keep your patio shaded. Your patios just got a whole lot more comfortable with our patio roller Austin outdoor shades. Here at Austin Shade Team, we believe in protecting your home the best way we know how. And the best way we know how is by providing a variety of products, including our extremely popular Austin TX outdoor roller shades. All of our outdoor shades Austin TX products are made right here in town. We make all of our patio sun shades here at our facility in Austin Texas. All of our porch shades are made from 90%, 92% and 97% shade densities. Pricing for all of these outdoor patio shades fabric options is the same. 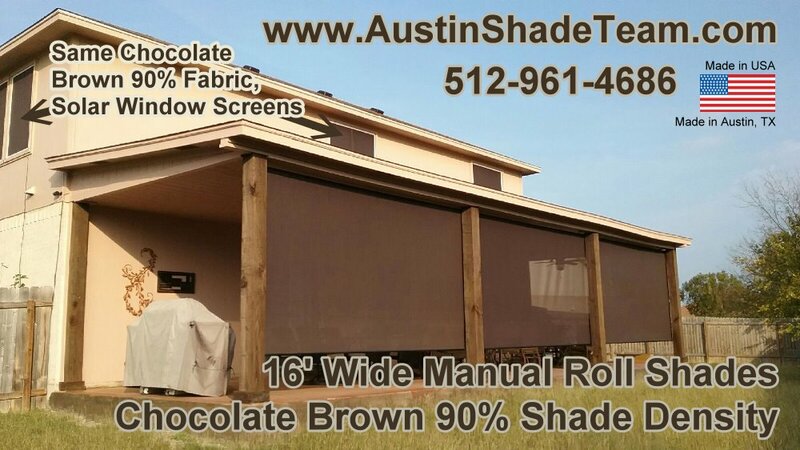 Our installed Austin outdoor shades pricing is based on width only and discounted priced by how many you want to put up. 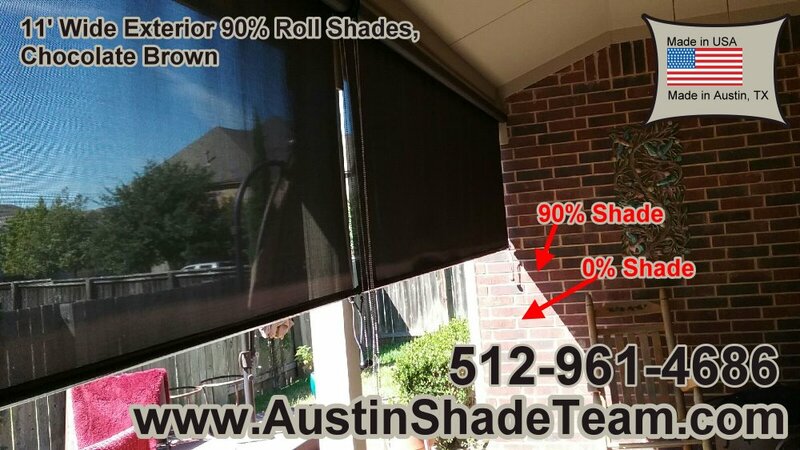 Installation and measuring is waived when you buy your Austin outdoor roller shades the same time as when you order your Austin TX solar screens. Easily manipulated, for temporary shade, you can roll your Austin patio sun shades down when you need them. Temporary shade for when you are on the patio when you need exterior sun shades. Imagine being able to sit on your front or back porch and enjoy a glass of lemonade (or other refreshing beverage) without having to be chased indoors by the bright sun. Our exterior patio roller shade screens will put an end to the sweltering heat and help cool your patio area during the harshest Austin summer months. Durability: Our outdoor shades for your patio or other outdoor area are made with all-exterior, non-corrosive materials so they will not wear down in the elements. Our Austin exterior sun shades also feature a tough, high-grade stainless steel pull chain for easy manoeuvrability. Protection: Our outdoor patio blinds aka exterior roller shades come backed by our 12-month warranty. We also feature a two-year repair protection for your chain and other parts. Remember, this will not cover against personal damage or damage to a roller shade that is left down during harsh weather. When your patio sun shade is not in need, it’s best practice to keep it rolled up. Customized: Our patio sun shades can drop as far as 82”, and in some cases we extend the length to our Austin porch shades to 99″. We custom build or Austin patio sun shades to last. Manufactured in-house, all of our exterior sun shades are designed by using the finest solar materials and fabrics. 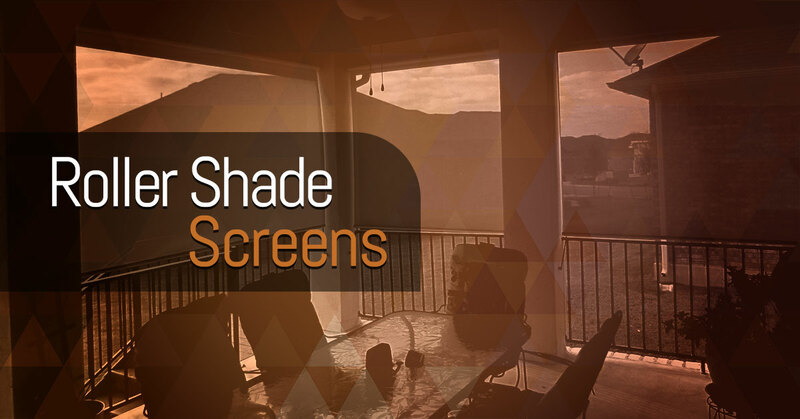 You can trust that when you have exterior patio roller shade screens from Austin Shade Team, you have the best. Porch shades for your patio are available in a variety of colors and sizes to fit your custom needs. Still have questions? We invite you to learn more about our service areas, take a look at some of our most frequently asked questions, and contact us to order your roller patio Austin TX outdoor shades today.